Head down to the Coliseum for an epic duel. The Gladiator slot from BetSoft has all the excitement of a battle-to-the-death, with none of the risk of getting your head chopped off. It has a great feel to it with its epic marching music driving the action. However, it does lack some of the impressive visuals and animations we know BetSoft are capable of. In terms of features, Gladiator is incredibly well stocked. It offers several different side games, and even the chance to win big cheering your chosen fighter on in a bloody battle. Many great bonus features. The addition of an action-packed, second-screen “dual” side game is thematically appropriate and provides plenty of excitement for players. Great feel. The crowd noises, and epic Roman battle music make playing Gladiator an atmospheric experience. Not as visually appealing as other BetSoft titles. There’s nothing wrong with it per se. It’s just when you’ve seen what their art team came up with for titles like “A Christmas Carol”, it’s hard to be impressed with Gladiator’s visuals. Very low upper betting limit. We’re used to makers like Playtech allowing us to bet up to £2,000 a spin. Of course, not everyone will mind this drawback but high rollers might find it just too restrictive. The top jackpots are won by hitting five-of-a-kind of the same symbol across a single win line – all that is, except the prize for five Coliseum’s. This is paid out for any five of the necessary symbols in any position (“scattered”). The prizes for the top winning combination of each symbol has been listed below. Coliseum = 750x the line bet. Either gladiator symbol = 400x the line bet. Sword, or mace = 250x the line bet. Horse = 100x the line bet. *Payouts listed above are for one bet per line. 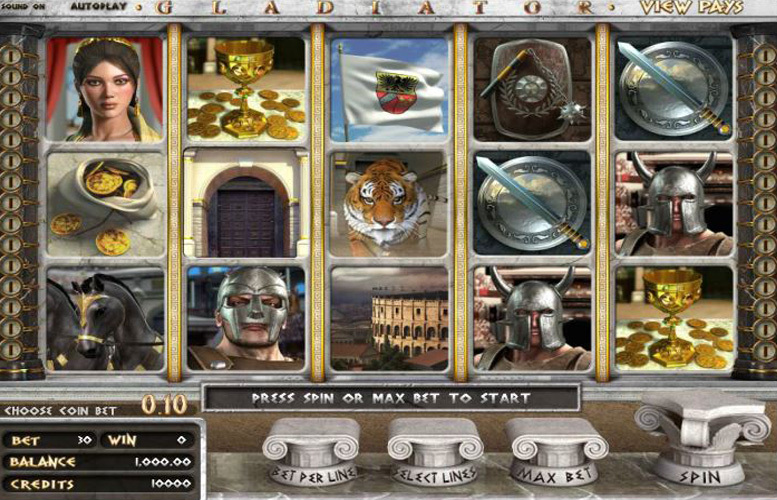 The Gladiator slot machine features pay lines which run in both directions. This means that as well as paying from left-to-right, they’ll also pay for matching symbols running from right-to-left. Landing a Princess symbol in the first position on reels two, three, and four triggers the “Wild x2” feature. The Princess will toss a handful of rose petals below her. As the petals touch the symbols, they are turned into 2x “Wild” symbols. Any win combinations that feature a “wild 2x” symbol is paid at double the quoted prize on the pay-out page. 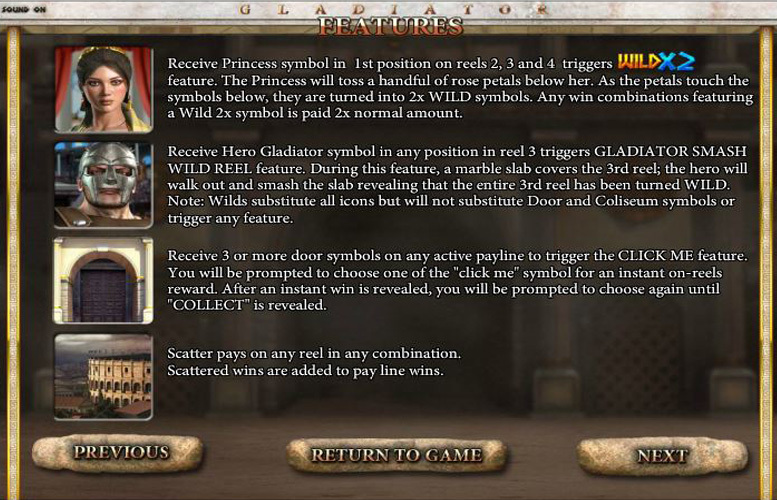 Landing a “Hero Gladiator” symbol in any position on reel three will trigger the “Gladiator Smash Wild Reel” feature. During this feature a marble slab covers the third reel. The hero will walk out and smash the slab revealing that the entire reel has been turned “wild”. Players should note that “wild” symbols do not substitute for the “Door” or “Coliseum” symbols. Landing three or more door symbols on any active pay line will trigger the “click me” feature. 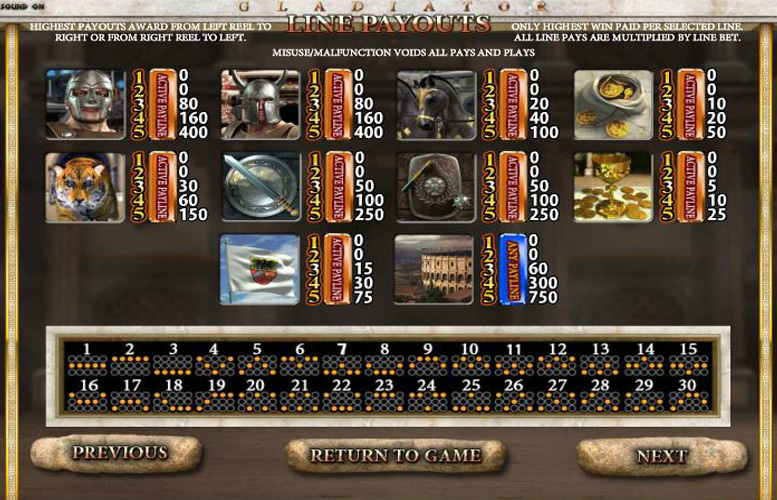 Players will be prompted to choose one of the “click me” symbols for an instant on-reels reward. After an instant win is revealed, they’ll be prompted to choose again until a “collect” is revealed. Receiving a Hero, Coliseum, and Villain symbol consecutively on pay lines one, two, or three, on reels, two, three, and four will trigger the Gladiator BATTLE second screen bonus round. 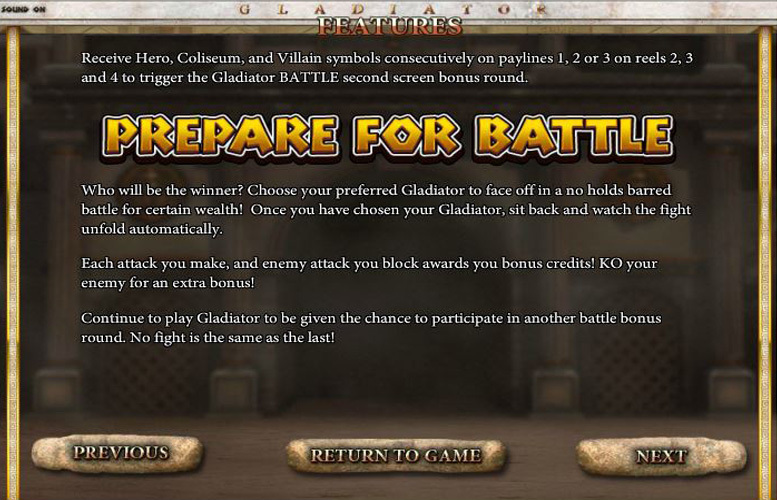 Players must first choose their preferred Gladiator, before facing off in a no holds barred battle for certain wealth. The fight takes place automatically. Every attack the player’s combatant makes or every enemy attack they block will earn bonus credits. If the enemy is knocked out, they’ll receive an even juicier bonus. Flag = 75x the line bet. Coins= 50x the line bet. Chalice = 25x the line bet. Players are given maximum control over how they spread their bets out on Gladiator. They can alter the number of win lines they play (one to 30), and how many coins they want to bet on each (between one and five). In addition, they can adjust the value of every coin. The lowest here is just 2p, and the highest is £1. This means, with all variables set to the minimum, the lowest possible bet per spin is just 2p. Meanwhile, with everything maxed out, the highest is a rather unimpressive £150. Whilst this is easily large enough to satisfy most bankrolls, some high rollers will undoubtedly find it restrictive. Gladiator is a gripping title that uses strong music and sound effects, along with great gameplay features to create a memorable slot experience. Whilst the visuals might not be up to the usual high standard we’re accustomed to with BetSoft machines, the gameplay is solid, and the topical bonus features makes Gladiator a title we’re comfortable recommending. This game has a rating of 4 / 5 with 763 total reviews by the users.